Okay. In this section, what we're going to do is look at the different parts of a theme and what they do. Let's begin by looking at the output of a theme and work our way into the backend from there. So when you're looking at a page, you're looking at output that's generated through the theme layer. Now, there are different sections on the page and those different sections are called regions. Typically, regions will into categories like header, footer, first column, second column, and main body content. More complex themes will add additional regions. For example, subheader or subfooter in order to allow more specific placement of blocks on page and that's really what regions are for. They expose areas on a page that can be manipulated through the user interface to, for example, add blocks to particular regions. 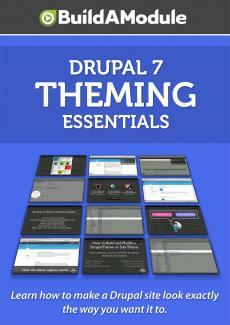 A theme folder also includes any template file or theme function overrides that exist in the theme layer. So for example, if we want to override the output of all nodes on our site, we could create a new node dot tpl dot php file anywhere inside of our theme structure. If we wanted to override a theme function, we would use a special file that's included in a theme folder called template dot php. A template dot php file is where all of the logic goes, all for the code that's not just embedded inside of a template file. For example, any preprocessing functions that take care of manipulating the output or doing some sanitization before it gets sent to a template file, all of those live inside of the template file, template dot php file. And any additional utility functions that are used on the theming layer can be added to that file as well.